Back Enjoy and network music digitally. Rich sound and attractive design: The JUNG Smart Radio DAB+ is an optical highlight and always hits the right note. 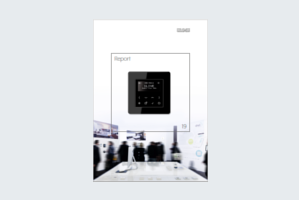 Smart Radio DAB+ is available in various frames in the JUNG design. In the version with Bluetooth, you can additionally stream your own music to the device. You don’t have the right CD available at home? No problem! The DAB radio receives innumerable public and private programmes throughout the country via DAB+ and VHF. It stores up to eight stations per reception mode. With its elegant glass front in the form of a switch, the Smart Radio DAB+ is both a technical and an optical highlight. In addition to VHF reception and digital radio, the Smart Radio DAB+ Bluetooth version also communicates with smartphones and tablets. Once paired, you can listen to your own favourite hits. Enjoy the best songs from Spotify, Internet radio or from all other sources on the Internet – conveniently by WLAN and smartphone instead of an aerial. 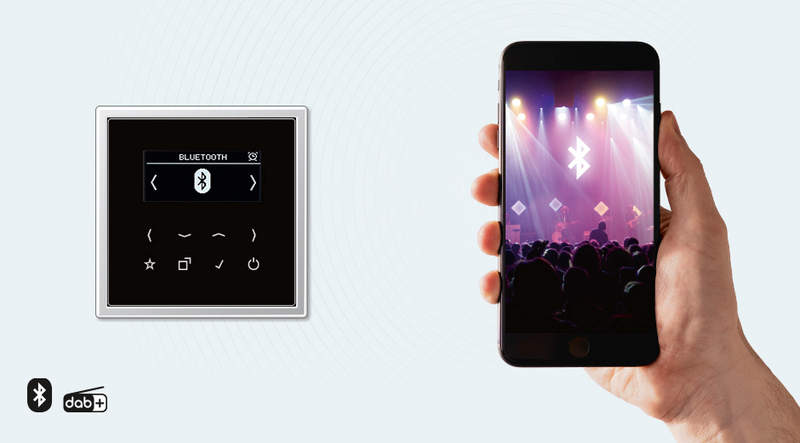 The buttons also allow music fans to control the individual songs or change the name of the Smart Radio DAB+ with which the device is found via Bluetooth. 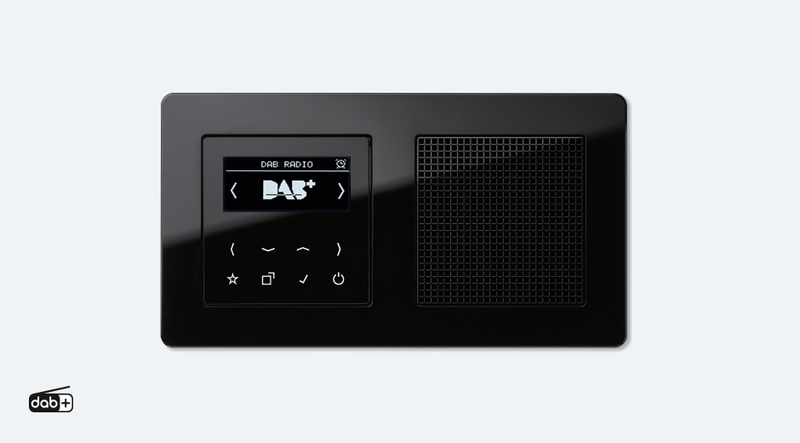 Thanks to the flexible connectivity of the digital radio, you can also change the reception mode during operation without problem: simply switch to and fro between DAB+ and VHF – and listen to the best music at all times. Completely independent of regional coverage. Best mood even from daybreak: With the wake-up function, the Smart Radio DAB+ plays your favourite radio station or - in the Bluetooth version - your favourite song to wake you in the morning. Summer or winter time? The device automatically updates the time via RDS and DAB+. Listen to the radio play before you go to sleep or listen to soft sounds for a few minutes? With a sleep timer, Smart Radio DAB+ switches off exactly when you want it to. Getting up or being woken up at night by music? Not with the Sleep mode! If you like to go to sleep listening to music, the Smart Radio DAB+ is well suited to you. In night mode, the device darkens the display. This means that there is no reason why it should not be mounted directly by the bed, as there is no light to disturb when falling asleep. 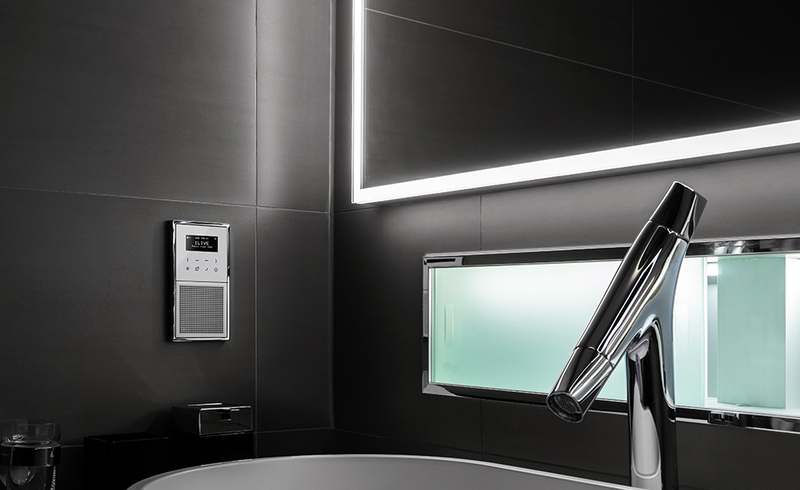 Whether at bright places in the bathroom or at dark corners in the bedroom: The display brightness of the Smart Radio DAB+ is individually adjustable. 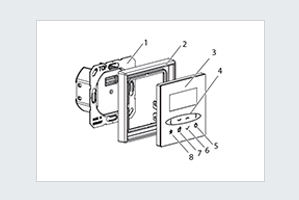 This allows you to see the displayed stations, songs or settings even in low light or strong sunlight. Structure, product properties and much more: These instructions will help you with the installation.